FOODIES are expected to shell out on seafood this Easter, with the fishing industry reeling in many popular seafood species. Australian Ocean King Prawn Company spokeswoman Elaine Lewthwaite said sales in seafood always shot up in the week before Easter. While fish is the most popular thanks to Good Friday traditions, Mrs Lewthwaite said crustacean and shellfish were also expected to sell well. "It is all down to someone's taste," she said. "A lot of people have a bit of everything." The store, which specialises in prawns expected most people to buy their seafood next week. "There will be a good selection of local fish," she said. "We've got some great prawns." Fisheries Queensland industry development general manager Robin Hansen said Easter was traditionally a time for strong seafood sales. Mr Hansen said some species were particularly popular across the state. "Crab is always a favourite with consumers and at this time of the year both muddies and blue swimmer crabs are available," he said. "Banana, endeavour and tiger prawns are also in season and tend to be quite popular as they are easy to prepare and work well with many different flavours," he said. Mr Hansen said blue or king threadfin were also now in season for fish fans. "Consumers can also keep an eye out for grey mackerel (or broad-barred mackerel) and queenfish, which are available throughout the state." He also highlighted the health benefits of seafood and said a single serving would provide half of the daily protein requirements, making it a great alternative to red meat. 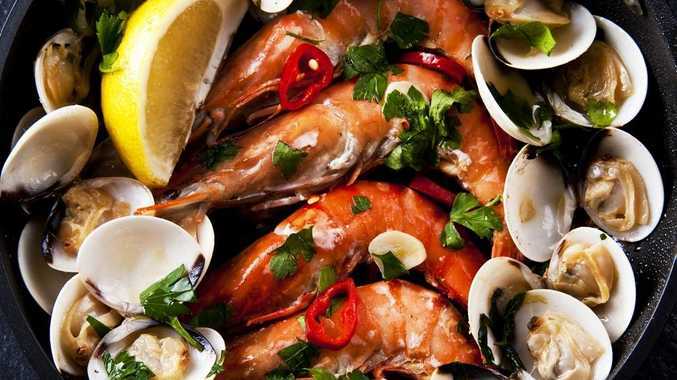 Seafood Services Australia advised consumers to store seafood safely in the lead-up to Easter. It advised people to make sure seafood was as fresh as possible before freezing it for anyone getting ready ahead of time. Visit seafood.net.au for more tips on storing seafood.